DT regular contributor Scot C posted a link on our facebook page and asked that we help spread the word about an auto shop class that needs a few bones. Maybe it's a good day to skip your afternoon Starbucks Harbor Freight run today and donate $5 to a worthy cause. Head over to kickstarter and check out the plans to restart an auto shop program in La Canada Flintridge, CA. 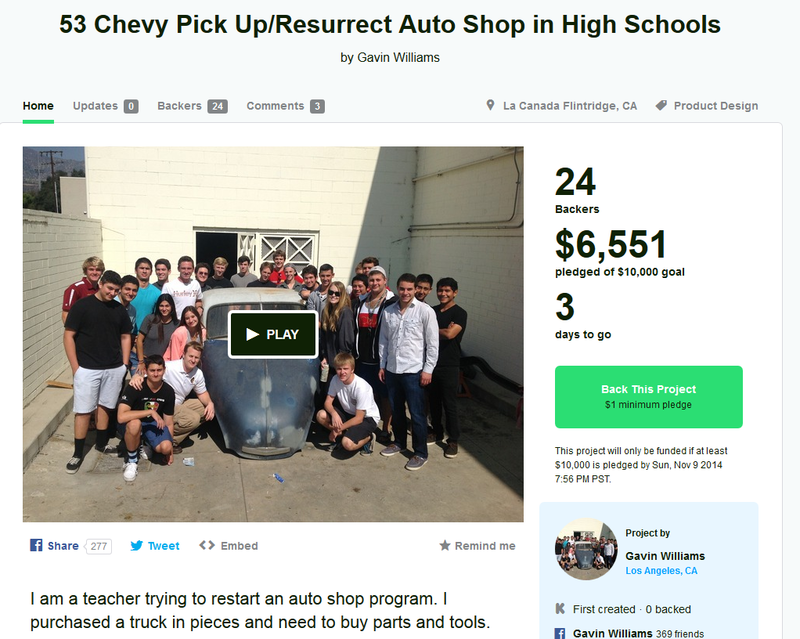 Gavin Williams has already donated a significant portion of the cash and is going to invest a big chunk of his time into giving a few dozen kids the opportunity to wrench on a '53 Chevy pickup in between instagramming each other. All you need to do is throw in a few bucks (we just did! ), because in a world filled with self driving cars, dropping teenage license rates and general apathy towards anything not on a touchscreen, this is a worthy cause. Gettting this funded would be a great way to honor the memory of Tom Magliozzi. ~ Great thought, Hb. I believe that I will make a second contribution in memorial. ~ I did increase my pledge but Kickstarter doesn't ask for comment or honoraria. I am going to post DTs link to Car Talk and forward your suggestion. Thanks for publishing this. This is the high school I went to and there was a complete lack of any kind of hands-on classes. Not all of the kids that go there fit into the AP-class-Ivy-league box and this would be a great opportunity for them! ~ Thanks for supporting the cause, Brian. Help spread the word. I went to the old Lincoln HS in the Seattle area we had a great Auto shop and we got great support from Chrysler and there Chrysler Trouble shooting contest. We had a lot of old stuff but did get some new stuff as i finished my years. there. I believe Ford had a program too. Would be real nice to see some help from the car makers for some support or program for jobs in that industry for our schools. I certainly enjoyed my shop classes @school more then anything else. Part of the reason that I felt so strongly about donating to this cause is due to the lack of exposure that I had to automotive/welding classes at my east coast schools. We moved around a lot and I was too young to take the courses in one school, and they were already full in another school when I transferred in my last semester of my senior year. Any time a teacher is willing to give their time/talent and extend their own $$ to give something to our kids we need to support them. ~ I want to say thanks to every one who took the time to watch the video, spread the word of this cause or to make a contribution. Tony Gauntner﻿ has just contacted me to say that their goal has been met and that the project will go forward !!! THANK YOU. The exposure that you gave these kids was an act of extreme kindness demonstrating the brotherhood of the car hobby. Anyone ever have an update on this? From what I can tell, it looks like none of the pledge level rewards were ever sent out, which only really seriously disappoints me if it means the money wasn't used as intended. Would love to hear if/how the money was put to good use. 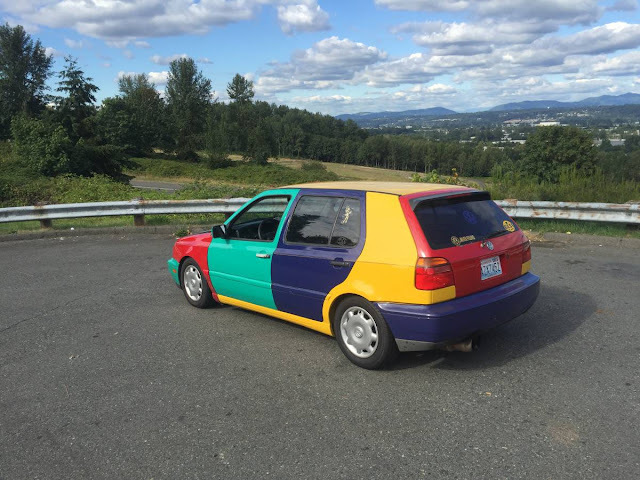 THANK YOU---To Scot & friends....a couple weeks ago I asked Scot to spread the word about his great group of high school students who wanted to launch an Auto Shop Club / Class @ their school. These 45 kids convinced their fellow gear head & instructor Gavin Williams to start a Kickstarter campaign to raise seed money for tools & equipment,& to work with their school administration to advance this concept. Thanks to your generosity & continued support I'm Thrilled to report that their fundraising campaign was successful, generating $10,156. Gavin has asked that I extend his gratitude to each of you ,as these young men & women will now acquire skills,experiences & memories that will last a lifetime. I am escpecially greatful to Scot for his overwheming support that made this endeavor a reality. Good deal...thanks Scot. Again, I don't care about a postcard or t-shirt in the grand scheme of things, but like so many things on Kickstarter, I just like knowing that the money went where intended. thanks!